We were all blessed to know Susan and share her life. I will cherish her friendship always. Susan was my friend, teacher, and colleague. She taught me most everything I know about making art with tissue paper, marketing and selling art, and how to run an art gallery and co-op—all of which I have managed to do over the many years we knew each other. I want to tell you about a bond we had. We had the same mentor, the colorist Gloria Foss. Since Gloria’s passing, Susan carried on her legacy of teaching collage; and I continued Gloria’s method of teaching oil painting and how to turn the form. Susan co-authored their textbook entitled Paper Dyeing for Collage & Crafts, and I had the privilege and honor of doing many of the photographs for How to Paint by Gloria Foss. We both loved to quote her to our students in class: “Gloria says . . .” Ahaha. But we go back further than that. I first saw Susan when she was introduced by Ramsay Goldstein at a meeting of the Honolulu Branch of The National League of American Pen Women. At that time she was working at Ramsay Gallery in Chinatown. She flashed her big, cheerful smile, that toothy grin, happy to meet other artists, writers, and composers. I could see instantly that she was someone special. She looked like she would be good fun! At that time I was a Letters member only, working with words, not images. Susan joined as an Art member. The Pen Women Art members were such an inspiration. I gravitated to learning about color and how to paint—from Gloria! 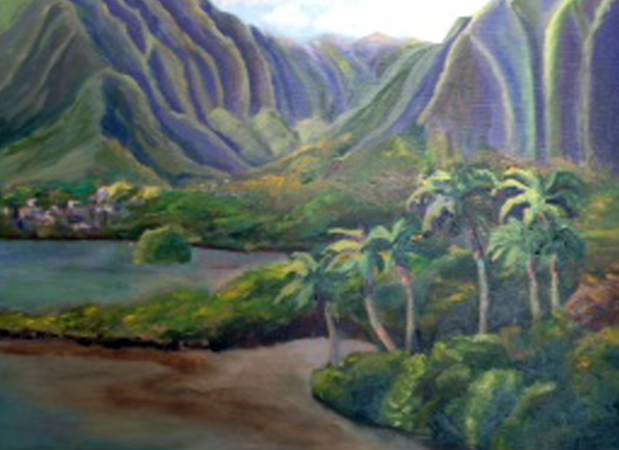 Shortly after I had the guts to hang my paintings at the Honolulu Zoo Fence, Susan invited me to join the Arts of Paradise Gallery at the International Market Place, and the rest, as they say, is history. I remember one day when Susan called and told me how sick Gloria was and how she was at her bedside urging her to hang on to life. No luck. Similarly, when I visited the Aregger home it was two days since Susan had lapsed into a coma. Dan and her hanai sister were there, as were two caregivers. The doctor had left, and they said he would come again the next morning. It was a beautiful day as I watched their whirligig in the wind on the beach, the wind blowing the clouds and the palm fronds, too, reminding that life is a continuum. I gave Susan some Reiki. To think of this world without me in it. Without me here . . . somehow . . . someway. Without me here . . .alive . . . aware. At swifter pace . . . but this I know . . .
Of the marked day that lies ahead. But I’ll be here . . .
People who make fine art often work alone. Like writers and composers, they start with a blank canvas and require solitude to put their ideas down. Sometimes, when they think they have taken their work as far as it can go and prior to publishing, they work with a team. Working with others helps artists to develop a thick skin because one is surely to receive criticism, constructive or not. When an artist is brave enough and has the guts to put work on display for others to see—others besides family and close friends—that is a milestone. The next step may be to price the art. Imagine: someone may want to purchase it! Along the way, colleagues and mentors will help. Mine, Susan Rogers-Aregger, taught me everything I know about finishing paintings so that they are ready for exhibit, how to market art, and how to manage a gallery. I am so very grateful. Yesterday, her tutelage reached another high point with the opening of the group exhibit “Collages and Clay” in Kāneʻohe, Oʻahu. A sparkling collage painting and ceramic masks by Susan Rogers-Aregger greet visitors to new exhibit at Ho‘omaluhia Botanical Garden. A dozen artists, all influenced by Susan who also works in clay, combined their hand-dyed tissue paper creations and pots for an exciting display. Friends and family came to celebrate at the reception. No longer alone, we met each others’ human support system and became better acquainted with the lives of the rest of the team. My sister artists and new friends at the opening reception—Hiroko, Maite, and Dottie. The fat cat in the background is my creation entitled “Living Large.” It has sold! Bob and Tommy of The Band Tantalus entertained guests with acoustic sounds. Warm to cool palettes grace the gallery walls. By the way, artists love sales. A sale for one is a sale for all! Selling our work is how many of us make our income, and it is wonderful encouragement to keep going. Thank you! Recently I received two emails, sent separately by two individual buyers who photographed my work in their homes and shared the images with me, to show me how they used my paintings in their decor and their artistic eye. That kind gesture took why we make art to another level of appreciation and enjoyment. 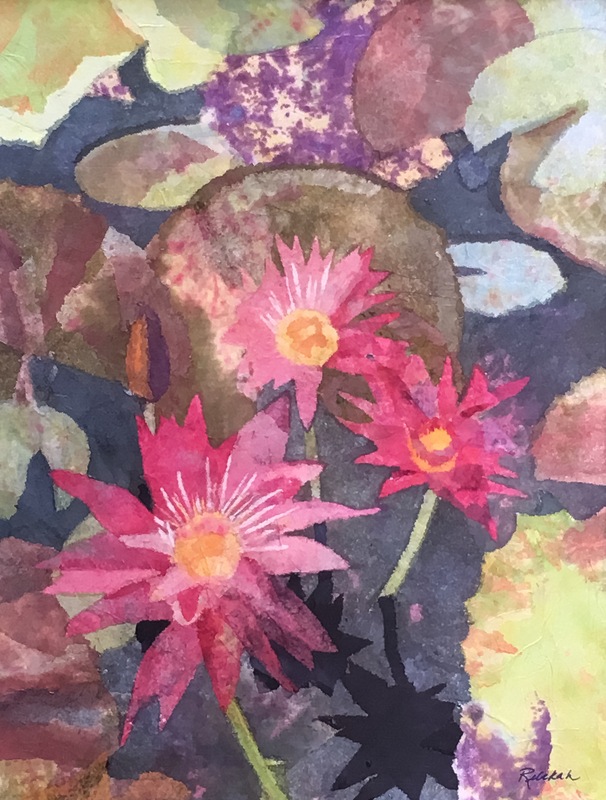 If you go— “Collages and Clay” runs through April 29, 9 a.m. to 4 p.m. at Ho‘omaluhia Botanical Garden Visitor Center, entrance at the end of Luluku Road, Kāneʻohe, Oʻahu. 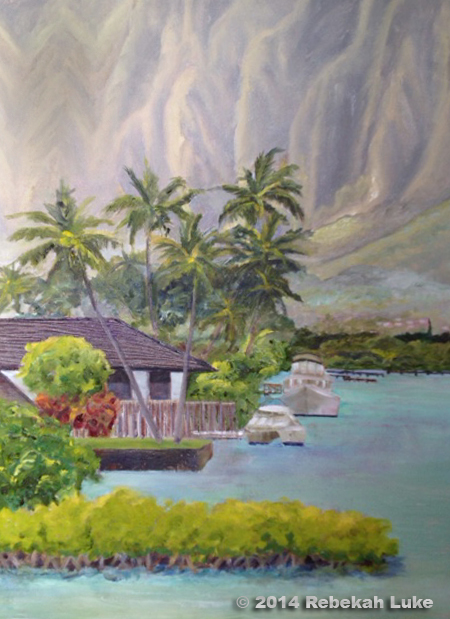 Aloha studio fans, art patrons and appreciators! 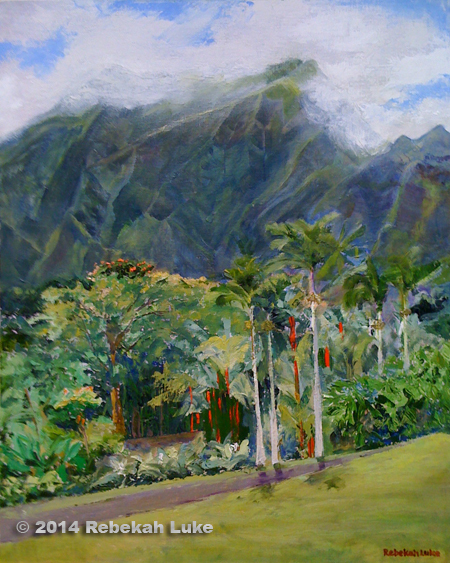 I’m taking this, my latest creation, to exhibit at Hoʻomaluhia Botanical Garden for the month of April. 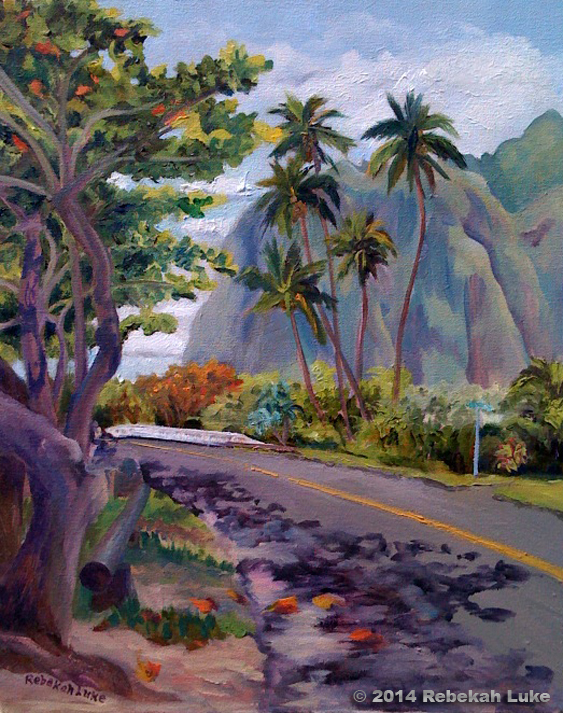 The opening reception for “Collages and Clay at Hoʻomaluhia” is from 1 to 4 pm, Sunday, April 3. Entertainment by The Band Tantalus. Please come! This is a newish art medium for me, a departure from landscapes in oil paint after 25 years. I hand-dye the tissue paper with my colleague and teacher Susan Rogers-Aregger at her workshop (it takes a small crew). Folks say they prefer the collages because of their translucence and vibrancy of color. I like the way the technique lends itself to abstract images. What do you think? UPDATE: Good morning! Here’s a reminder that our art show is still up and that there is still time to view this fascinating art medium. The club’s dining room is open to the public, so while you’re there you can grab a bite. Bring a friend! Click here for a map. 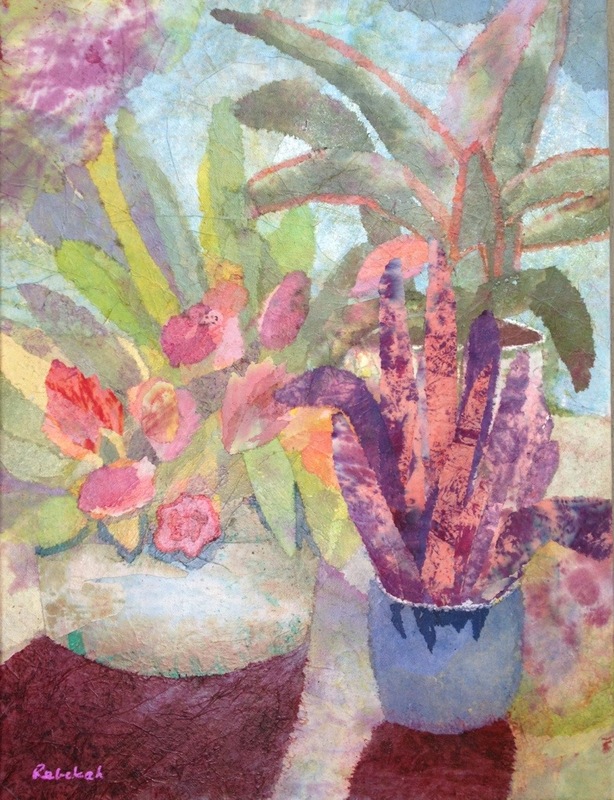 “Collages & A Bit of Clay,” an exhibit of original art work curated by Susan Rogers-Aregger, is on view to August 8, 2015, at the Honolulu Country Club Gallery, 1690 Ala Puumalu Street, Honolulu 96819. There are more than 60 works in the show, including these three by yours truly. The public is invited to meet the artists at a reception from 5 to 7 p.m. on Sunday, July 5. My unique collage paintings are created with tissue paper that I dyed by hand, glued to canvas, then scraped and carved with a knife for the design while being careful to not poke a hole in the canvas! Mangos and more mangos! I am experimenting with a different art medium — collage with hand-dyed tissue papers. Here is my third piece finished yesterday, a diptych composed of two panels. I plan to put both into one frame for the square shape shown. The big mango tree in the corner of the studio garden cooperated this year by bearing luscious fruit that we are enjoying. We are able to pick the mangos before the cherry headed conures get to them. That and the color palette of tissue papers that I had on hand inspired the work. Managing the thin, flimsy papers with glue, water, and X-ACTO knife is tedious work and messy. At times it is carving paper, either wet or dry, being careful not to poke a hole in the canvas! In the end, I love the effect of layering and the jewel toned quality of the finished collage. My colleague Susan Rogers-Aregger taught me how to create with this medium. She learned it from Gloria Foss, our late oil painting instructor and mentor. Together they wrote Paper Dyeing for Collage & Crafts (Honolulu: Belknap Publishing & Design, 2004; ISBN 0-9723420-3-6). 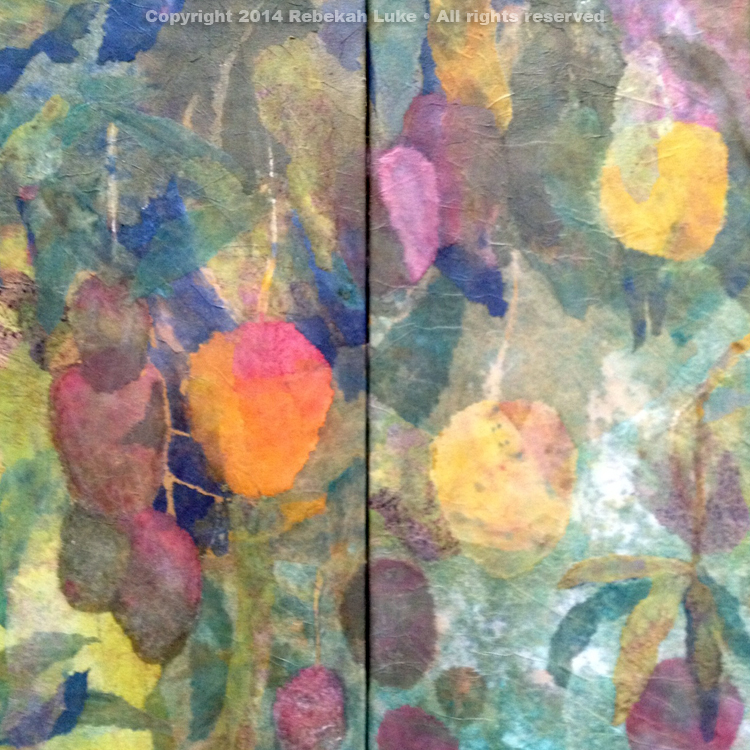 Susan has scheduled her next paper-dyeing and collage workshops for February 2015 in Kaneohe, Oahu. … until I looked at it again in a different light. Even my teacher said it was “pau” (finished) when she saw the first photo of it on Facebook. When I brought the collage to the next studio session for a group critique, we stared at it from a distance and under a skylight. The consensus was to strengthen the value of two areas on the bottom. So I did, and to me the change made a more successful and more attractive piece. Isn’t that true of life? Sometimes we ponder and struggle to make things just so, willing to put others’ opinions above our own, but the something isn’t quite right. Something about it bothers us. Then, by letting it rest and revisiting it from a different angle in a new light, we notice just a small tweak here and there brings the subject into focus. “After” I added darker pink tints of paper at the bottom. It’s a subtle change that shifts the viewer’s focus.